New research is weakening the rule of the original keystone species and, in the process, complicating an iconic idea in ecological science. Once you notice the Leptasterias, Gravem says, you notice that there are sometimes quite a lot of them—hundreds or even thousands of the sea stars in one small site. As she spent more time in the tide pools, Gravem realized that Leptasterias might have a bigger influence on coastal life than their diminutive size and relative anonymity suggest. She dug deeper into this idea, first as a graduate student at the University of California Davis-Bodega Marine Lab, and later as a postdoctoral researcher at Oregon State University. What she found might knock some of the luster off an iconic predator, and reveals the surprisingly complicated understory of one of the most cherished ideas in ecology. In 1969, ecologist Robert Paine—who passed away June 13—laid out his keystone species hypothesis. Based on his observations in the tide pools of Mukkaw Bay, Washington, Paine argued that the charismatic ochre sea star, Pisaster ochraceus, played a crucial role in controlling the tide pool ecosystem. When Paine removed Pisaster from tide pools, mussels quickly overran the site, crowding out other species and establishing a monoculture. He realized that Pisaster had an effect disproportionate to its abundance in keeping the tide pool ecosystem in balance—an insight that, over the last half-century, has been applied far beyond the coast. Paine spent his professional life elaborating on the complex web of life in the tide pools in Mukkaw Bay. Within months of coining the keystone hypothesis, he wrote a second paper on the interaction between Pisaster and the black turban snail, Tegula funebralis. Paine suggested that the snails’ size and distribution were controlled by their “major predator,” even though snails weren’t Pisaster’s favorite (or even second-favorite) food. Scientists and journalists alike have since referred to Pisaster as the dominant carnivore shaping the size, distribution, and abundance of Tegula in a tide pool. To Gravem, it seemed that Paine and others might have overlooked the less-charismatic sea star hiding in the back of the tide pool. She was sure Pisaster was not controlling the sea snail population in the same way it controlled the mussels, but she didn’t necessarily have a replacement predator in mind, either. That is, until 2010, when an algal bloom caused Leptasterias to disappear from the tide pools she studied, and the Tegula population doubled. The next year, wasting disease struck Pisaster, and the snail population in her study area was scarcely affected. Paine’s keystone species hypothesis has yielded considerable insight into how ecosystems work. But several decades of follow-up work in other tide pools has shown that even the iconic Pisaster-mussel relationship is only relevant some of the time. Gravem’s discovery that Leptasterias sea stars control Tegula sea snails—not Pisaster—is a cautionary tale about assuming that a species that controls one important prey controls everything else. Even more, it reinforces the idea that, in ecology, context matters. If Pisaster is the king of the intertidal, then Gravem is part of a community of ecologists who are writing its Magna Carta: the conditions under which the keystone predator rules. Over the past four decades, for example, Gravem’s postdoctoral advisor, Oregon State ecologist Bruce Menge, has found that while Pisaster tends to rule freely on exposed coastal sites like the one Paine studied in Washington, the sea star’s influence is less pronounced in more sheltered areas. The keystone species’ controlling effect is prey dependent—there have to be enough mussels—and Pisaster population dependent—there have to be enough sea stars. It is size dependent, and probably temperature dependent as well. Menge has looked at sites up and down the Oregon coast, which allows him to study the effects that changing ocean conditions have on keystone relationships. As the evidence builds, researchers like Gravem and Menge are devising a refined keystone hypothesis, one that’s less rigidly hierarchical than the original. They see a habitat like the rocky tide pools of North America not as a stone archway held together by one critical species, but as a mosaic of interlocking dependencies. Eric Simons is the editorial director at Bay Nature magazine, and the author of The Secret Lives of Sports Fans, and Darwin Slept Here. He has been a lecturer at the UC Berkeley Graduate School of Journalism, and an intern sorter of small fishes in a marine lab. He lives in San Francisco. Cite this Article: Eric Simons “Shrinking the Keystone,” Hakai Magazine, Jul 7, 2016, accessed April 23rd, 2019, https://www.hakaimagazine.com/news/shrinking-keystone/. One day in 1963, ecologist Bob Paine started plucking sea stars off rocks and tossing them into the sea. 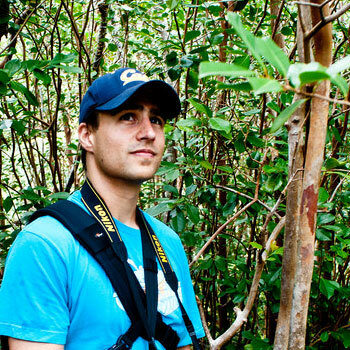 His study helped show how a species may be small in number but significant in its impact.